Elegant two piece necklace, and Bracelet set. 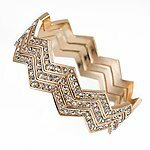 Comes in a Black and Gold combination or Silver and Gold Combination. Adjustable extender on back.Quantities are limited. Please specify color when ordering.